[A] launch pad from which the Jamaican-born writer, Margaret Cezair-Thompson, creates a wonderful confection in which Flynn becomes enmeshed in island life… the book helps to correct the view propagated by those, such as V S Naipaul, who claim that Caribbean islands have no history. 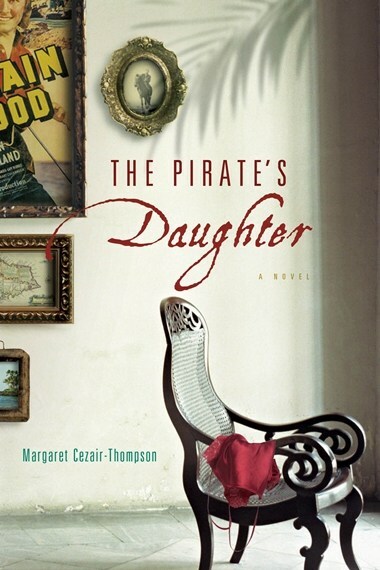 Instead Cezair-Thompson presents an island almost crushed by the weight of its long and tortured past… the breathtaking pace and verve of The Pirate’s Daughter make it a delight; a touch of summer reading in a grim winter. “Back in America, little was known of my life in Jamaica,” wrote Errol Flynn. In 1946, a storm-wrecked boat carrying Hollywood’s most famous swashbuckler shored up on the coast of Jamaica, and the glamorous world of 1940’s Hollywood converged with that of a small West Indian society. After a long and storied career on the silver screen, Errol Flynn spent much of the last years of his life on a small island off of Jamaica, throwing parties and sleeping with increasingly younger teenaged girls. Based on those years, The Pirate’s Daughter is the story of Ida, a local girl who has an affair with Flynn that produces a daughter, May, who meets her father but once. Spanning two generations of women whose destinies become inextricably linked with the matinee idol’s, this lively novel tells the provocative history of a vanished era, of uncommon kinships, compelling attachments, betrayal and atonement in a paradisal, tropical setting. As adept with Jamaican vernacular as she is at revealing the internal machinations of a fading and bloated matinee idol, Margaret Cezair-Thompson weaves a saga of a mother and daughter finding their way in a nation struggling to rise to the challenge of independence. The swimming pool dazzled her. She walked over to the edge and gazed down. Ribbons of sunlight wavered across the bottom. She knelt down and put her hand in the water. The voice startled her but she did not pull out her hand. She saw a man standing wet in the doorway with a towel around his waist and a drink in his hand. He saw a child who looked white but who wore a loose, faded old dress like the kind the servants’ children wore. He noticed, however, that she had on a good pair of leather sandals. Where on earth had she come from? “Who are you?” His voice rang out. She heard the crackle of ice as he lifted the glass to his lips. He studied her for a few more seconds. “Well, come in then,” he said and stood aside so she could come in. Inside, the floor tiles were larger than any she’d ever seen and she believed that if she were to touch them they would feel cool against her palms. Some of them were wet from the man’s feet. Her eyes swept round and she took in everything quickly: the dark, polished railing of the stairway, a bar with high stools, and a huge brown leather couch where she sat down, a little embarrassed at how unsteadily she sank into it. The walls were white and bumpy, and there was an enormous painting of a black horse on the wall. He studied her as he made himself another drink. His hands were shaking. The child’s resemblance to him was astounding. “Port Antonio.” He was not so white, she thought. She had seen whiter people. His tummy was big, almost like a pregnant woman, and she thought his chest looked a bit womanly too. He was almost as dark as her Lebanese grandfather was except for his very white feet. Was this him? The rich, handsome movie star everyone talked about who might be her father? Maybe not. She decided to question him. His eyebrows lifted in surprise, and he thought for a moment before answering her. She had never heard of it. She frowned. He took a sip, put his drink down, and then walked over to the couch. His weight threw her off balance when he sat beside her, and she almost toppled onto him. He was too close for her to look at without straining her neck, so she looked at her own feet. He touched her hair. “And you just appear, like Peter Pan,” he murmured.